'Chicken breasts' is one of the most frequent keyword searches that lead to this blog, and I suppose that's because people are always on the lookout for quick, easy recipes using this family staple. 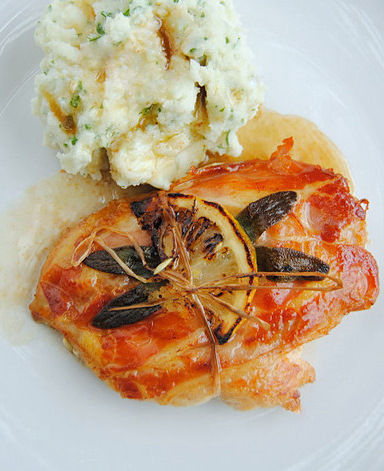 Here's a dish I love, similar to saltimbocca (an Italian contraction meaning 'it jumps in one's mouth'), but in place of veal I use deboned chicken breasts, and I deglaze the pan with a little lemon juice instead of the traditional marsala. The idea for sticking some cheese between the Parma ham and the chicken comes from one of Jamie Oliver's programmes (one of his Food Revolution series, I think), and what a good idea it is, although you can leave out if you're counting calories (not that this will make much difference: this is a dish laden with butter). The lemon slice, as it caramelises in the pan, imparts a lovely zesty perfume to the dish. I always tie the lemon slice and sage leaves on with raffia or string, because the thought of a sharp toothpick in a meal a child's going to be eating gives me the creeps. Don't let the butter get too brown in the pan, or the sauce will have a burned taste. Serve with a pile of fluffy parsleyed mash. Put the chicken breasts between two sheets of clingfilm or baking paper and, using a rolling pin, gently flatten them so that they're of an even thickness. Cover each breast with two slices of cheese, and then a slice of ham. 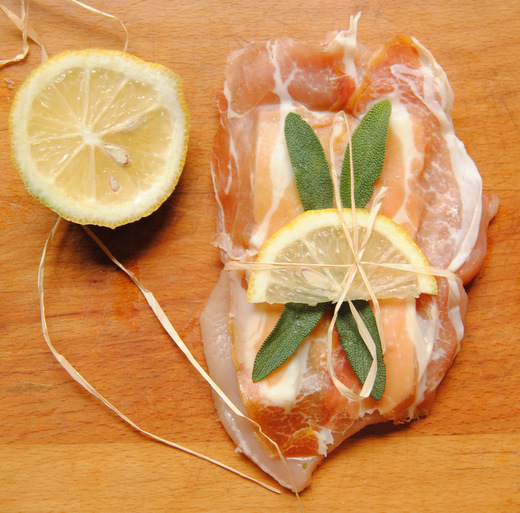 Place the lemon slices and sage leaves, as shown above, on the top, and secure with a piece of kitchen string or a strand of raffia. Press down firmly on the top of the breast with the palm of your hand. Heat the olive oil in a large non-stick frying pan. Add the breasts, lemon-slice down, and fry over a brisk heat for two minutes. Flip the breasts over, and fry the other side for another two to three minutes, or until the breast is cooked right through. Add the butter to the pan a minute before the breasts are ready, and use it to baste the tops of the breasts. Season with black pepper (you shouldn't need to add any extra salt). Remove the breasts and place on a warm platter. Turn up the heat slightly and add the lemon juice, swirling to release any bits of golden sediment. Allow to bubble for a minute, and then pour the sauce over the breasts. Serve immediately, with mashed potato. This is one of those recipes that I am going to keep on hand forever - so simple, but looks incredible and so beautiful - it will wow dinner guests!